Digi 1st P-C20 simple pedometers feature essential step counter, activity timer and distance counter. Besides accurately tracking the steps taken, these basic digital pedometers also record exercising time for walking and distance traveled in miles. To start using these step trackers, just easily clips them on with their durable belt clip and go. Three different models in this series respectively feature 30% larger LCD display, thinner ultra slim case, and popular classic design. 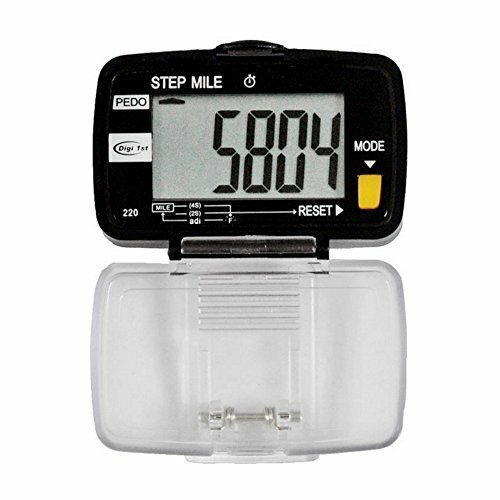 Because of the affordable price and enhanced activity tracking functions, these accurate walking pedometers are the best choice for a fitness program or promotional events. If you have any questions about this product by Digi 1st, contact us by completing and submitting the form below. If you are looking for a specif part number, please include it with your message.